Water column is how gas pressure is measured. The first devices to measure gas pressure were tubes in a U shape half filed with water. Pressure was applied to one side of the tube from a gas line and other side left open. How far the gas pressure pushed the water up the open side was measured in inches, and so it was given the name Inches of Water Column. What Type of Water Column Gauges are There? These are the most commonly used tools to measure gas pressure today. They come as dedicated pressure readers or as attachments for some multi meters. These use the same principles of the first gas pressure readers. Using water in a U shaped tube gas pressure comes into one side and pushes the water up the other side. The difference is measured to give the water column reading. These are not widely used anymore and have been replaced with electronic readers. U tube Manometer on Amazon. A Magnehelic works by using a diaphragm that is sensitive to pressure and move in or out depending on the pressure. The diaphragm is connected to a magnetic that turn a spiral (helix) in a circle as it moves up or down. The spiral is connected to a needle that will move giving the pressure. Analog Magnehelics are still used even though there are electronic replacements. Beside measuring water column they can also can be used to measure fan pressure, blower pressure, air velocity, furnace draft, pressure drop across orifice plates, liquid levels in bubbler systems, pressures in fluidic systems and filter resistance. These are dedicated gas pressure readers that are common. One side is connected to a gas source and the reading is given out on the gauge. How do you measure water column gas pressure? Gas is piped around the country at high pressure and stepped down as it comes into a home. The point it comes into a home the pressure will be 7 to 10 inches of water column. This is fed into a furnace gas valve to regulate the correct pressure for the furnace. 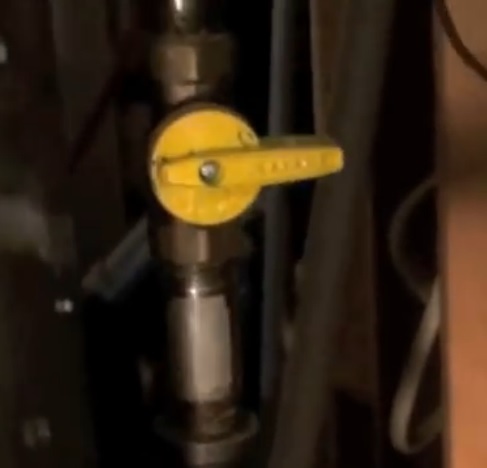 After the gas goes through a gas valve it becomes what is called Manifold Pressure. Furnace manufactures have deferent pressures and their furnace manual will need to be looked at for the correct pressure reading. This will usually be between 1 to 3 inches of water column. The gas valve will have a pressure tap located on it. Some gas valves will have a pressure tap on both sides while some only have one on the furnace manifold side. 2…Locate the pressure tap on the gas valve and unscrew the plug. Then screw in your Manometer. 3…Turn the gas back on. 4…Turn on the furnace and start it. 5…The manometer will give the reading in Water Column in inches. 7…Screw back in the gas valve plug using a small amount of pipe dope. 8…Turn gas on and check for leaks around tap screw. 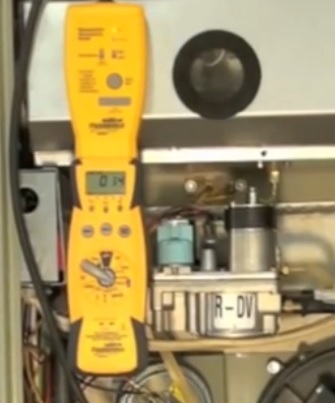 If a U tube, or Magnehelic Manometer is used they will show a vacuum when a furnace starts. This is normal since the inducer motor is pulling a vacuum which will show for a short time at the manifold side of the gas line. After screwing back in the gas valve tap be sure to check it for any leaks with soap and water. This is often over looked causing problems later on. 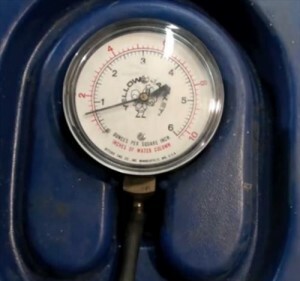 Checking the water column pressure is a easy task with the correct safety procedures and tools. 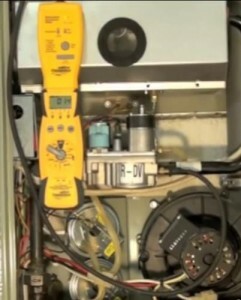 Any of the tools mentioned above will read the gas pressure when used correctly.